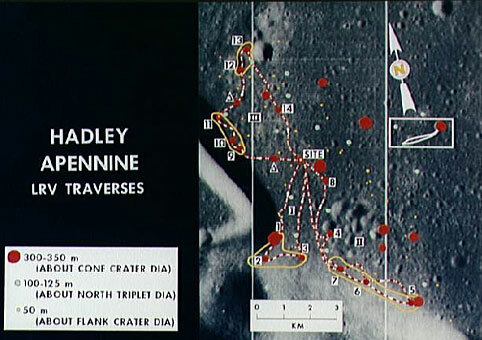 Lunar orbiter photograph showing LRV traverse routes overlaid on landing site Description: An enlarged Lunar Orbiter photograph showing the Lunar Roving Vehicle (LRV) traverse routes overlaid on the Hadley-Apennine landing site. Apollo 15 is to land at the point labeled “site”, and a comparison of Apollo 14 crater sizes with those of Apollo 15 is included, also. The micrometeoroid experiments flown on all five Lunar Orbiter spacecraft provided measurements in the near-lunar environment of the rate of penetration by meteoroids of 0.025-millimeter beryllium copper detectors. Each spacecraft carried twenty detectors, totaling an effective exposed area of 0.186 square meter. The spacecraft flew both equatorial and polar orbits at altitudes ranging from 30 to 6,200 kilometers and. collected data on micrometeoroid impacts for a period of seventeen months. A primary goal of the experiment was to obtain data for the purpose of comparing the meteoroid hazard near the Moon with that near the Earth. These data would aid the Apollo Program in the determination of the amount of protection necessary for the spacesuits, instruments, and spacecraft. Moreover, they would refine the estimates of the hazard in near-lunar environment which scientists had made and which ranged from somewhat less to greater by several orders of magnitude than the hazard near the Earth. A major uncertainty was the contribution of secondary meteoroids created by the impacts of primary meteoroids on the Moon. Before the Lunar Orbiter missions, only the Soviet lunar satellite Luna X had measured meteoroid flux near the Moon. The results of its experiment showed that the average rate of flux of micrometeoroids exceeded the average for interplanetary space by about two orders of magnitude. To arrive at the average rate of flux for the five Lunar Orbiter micrometeoroid experiments, the primary investigators (Gurtler, Kinnard, and Grew) divided the total number of recorded punctures by the total time-area product. The five Orbiters recorded 22 punctures during a time-area exposure of 139.0 square meters per day. These figures gave an average rate of 0.16 puncture per square meter per day (m2 x day-2) in the near-lunar environment, or about one half the average rate of flux recorded by the Earth-orbiting satellites Explorer XVI and Explorer XXIII. The investigators found by analysis of the 22 punctures of the micrometeoroid detectors, in relation to spacecraft positions at time of impact, that there was a preponderance of punctures on the side of the spacecraft facing forward in the orbital direction of movement around the Sun. This preponderance agreed with Earth-based radar observations cited by Q. S. Hawkins 23 and indicated that the influx of meteoroids on the side of Earth facing forward in orbit around the Sun was several times greater than influx on the opposite side. 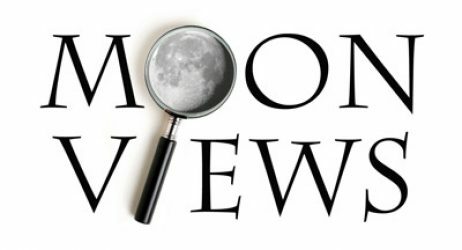 Preliminary estimates of the flux of secondary meteoroids near the Moon indicated that flux was greater nearer the lunar surface and dropped off sharply with increase in altitude.25 Further study of the Lunar Orbiter data indicated no statistically significant variation of hazard with altitude. Gurtler and Grew concluded in the summary of their analysis of the micrometeoroid experiment data that the penetration rates in the near-lunar environment as well as near the Earth should be accepted as being only tentative since the number of recorded penetrations was statistically small and the meteoroid flux near the Earth’s orbit might vary from one measurement period to another. However, the data did indicate that the penetration hazard for 0.025 millimeter of beryllium copper was no greater near the Moon than near the Earth. Nor was there any substantial evidence that the hazard in the near-lunar environment increased as a result of secondary meteoroid impacts caused by primary impacts on the Moon. In addition to selenodesy the Planetology Subcommittee selected two other fields of scientific investigation for experiments on the first five Lunar Orbiters which made up Block I of the program. These were radiation and micrometeoroid flux in near lunar environment. The two experiments which Langley developed for the Orbiter were designed to measure the performance of the spacecraft as well as to provide useful data on potential hazards to manned missions to the Moon. The Principal purpose of the lunar orbiter radiation-measuring systems was to monitor, In real time, the high radiation doses that would accumulate on the unprocessed film in case of major solar cosmic ray events. In this way It would be possible for the mission control to minimize the darkening of the film by operational maneuvers, such as stopping the photographic operation and acceleration of development of the film in the loopers, and in case of more penetrating events, shielding the film in the cassette by the spacecraft itself and by the moon. Furthermore, the independent measurement of radiation doses would contribute to the diagnosis of film failure due to other reasons. A second purpose was to acquire a maximum amount of information on radiation on the way to the moon and near the moon, insofar as this could be achieved within the weight limitation of 2 pounds. The danger that the film could be damaged by solar radiation had Dr. Foelsche and Dr. Samuel Ketzoff worried because the Eastman Kodak photographic subsystem provided only aluminum shielding at two grams per square centimeter at the film cassette and at two tenths of a gram per square centimeter in the rest of the system. Foelsche desired thicker shielding, but the contractors maintained that the film would be safe. The amount of shielding was a calculated risk, trading shielding weight against the probabilities of solar flare intensities. Although he would have preferred to mount a more sophisticated experiment, Foelsche designed a measuring system to carry out the objectives described above., remaining within a one-kilogram weight limit. The system’s sensors, their arrangement and shielding, the measuring principle and dynamic ranges were all developed at Langley. The Lunar Orbiter Project Office at Langley and the Boeing Company then determined the specifications for the hardware, and Texas Instruments built and calibrated the experiment. The data obtained from the radiation experiments on board the five Lunar Orbiter spacecraft had significant implications for the Apollo Program. What would be the approximate doses of radiation experienced by astronauts in space suits? In the Lunar Module? In the Apollo Command Module? 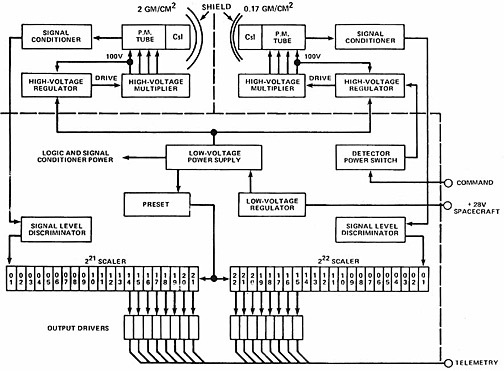 To obtain an answer, the primary investigator, Dr. Trutz Foelsche, analyzed the data recorded by the two cesium iodide (CsI) detectors in each of the five Orbiters. One of the two was shielded by 0.2 gram of aluminum per square centimeter, the other by 2.0 grams aluminum per square centimeter. Because of the higher absorption of protons and alpha-particles per gram per square centimeter in soft tissue or water, the doses recorded by the Lunar Orbiter dosimeters had to be multiplied by two. The analysis showed that all events recorded were of significance to a man in space only where shielding was light, specifically in a space suit or in the Lunar Module. The following table shows the skin doses that would be incurred in a space suit with shielding of 0.17 gram per square centimeter in the presence of three solar particle events. In summary, the Lunar Orbiter radiation experiments contributed to four areas of scientific interest in addition to monitoring the doses on the camera film. First, they allowed estimates to be made of the skin dose rates behind 2 grams per square centimeter of shielding for astronauts passing through the Van Allen Belt. The estimates made from these data were based on an assumption of five passes through the belt in a one-year period. Second, the experiments contributed to information about the Moon’s core. The weakness or absence of an intrinsic magnetic field of the Moon, which Explorer XXXV confirmed, indicated that the Moon has no extended liquid conducting core like that scientists accept for the Earth. Third, by comparing data of Pioneer V and VI (spacecraft that lagged behind or were ahead of the Earth while in orbit around the Sun) with Lunar Orbiter data, preliminary conclusions could be drawn concerning the spatial and lateral extensions and the intensities of solar particle flux during the 1966 and 1967 events. Finally, the experiments measured, by simulation, high skin doses in a light space suit near or on the Moon for the moderate size solar particle events of the August 1966 to August 1967 time span. From these data the inference could be made that in rare cases of large event groups, such as those of 1959 and 1960, the Apollo astronauts might experience skin doses greater than 1,800 to 5,000 rads in one week, if no precautions were taken. The radiation experiments produced data which confirmed that the design of the hardware that Apollo astronauts would use on their lunar missions beginning in 1969 would protect them from average and greater than average short-term exposure to solar particle events.